The 47-year-old Australian's legal action comes with speculation mounting that Ecuador is preparing to end its stand-off with the British government by terminating his high-profile stay. WikiLeaks founder Julian Assange is suing the Ecuador government for violating his "fundamental rights" and limiting his access to the outside world while in asylum at its London Embassy. Assange found refuge in the embassy in 2012 after a British judge ruled he should be extradited to Sweden to face allegations of sexual assault. That case has since been dropped but Assange fears being extradited to the United States to face charges over the WikiLeaks website's release of troves of sensitive US government files. WikiLeaks said its general counsel arrived in Ecuador on Thursday to launch a legal case against the government for "violating [Assange's] fundamental rights and freedom". "The move comes almost seven months after Ecuador threatened to remove his protection and summarily cut off his access to the outside world, including by refusing to allow journalists and human rights organisations to see him," WikiLeaks said. 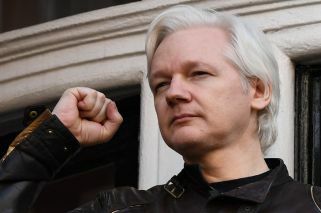 It added that the Wmbassy was requiring Assange's visitors – including journalists and lawyers – to disclose "private or political details such as their social media usernames". The Ecuador government issued no immediate statement in response. Quito confirmed blocking Assange's Internet and mobile phone access in March after accusing him of breaking "a written committment" not to interfere in Ecuador's foreign policies. A protocol governing Assange's stay at the Embassy – revealed by Ecuadoran internet site Codigo Vidrio and never denied by Quito – warns that further breaches will lead to "termination of asylum." The website reported that the embassy intends to stop paying for Assange's food and medical care in December. WikiLeaks lawyer Baltasar Garzón told a press conference in Ecuador on Thursday that Assange's conditions were "inhuman." "It is not a comfortable situation, it is an inhuman situation, because the solution that should already have been reached by the involved states is extending over time," said the lawyer. "We have to find a solution, to comply with what is established by the international law and certainly not aggravate the humanitarian situation of an individual, as I say, who is not deprived of liberty." Britain's Press Association news agency said the case is expected to be heard in Ecuador next week. US Attorney General Jeff Sessions said in March 2017 that arresting Assange for leaking sensitive US government files through his websites was a "priority."